A carefully selected hamper of some of the finest flavours to be found. 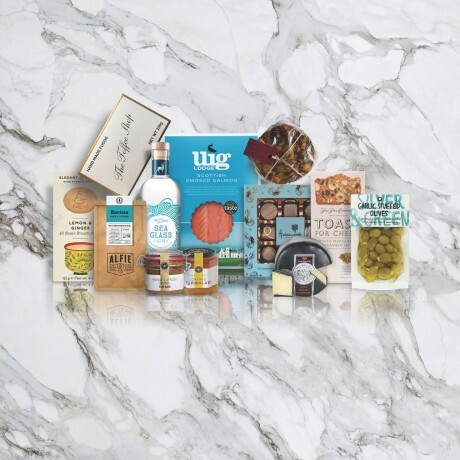 We have searched high and low across the UK to find the very best Christmas Hamper products. Half a sliced side of Uig Lodge Smoked Salmon (min 500g) A hand-sliced half side of our award winning oak smoked Scottish Atlantic salmon. Perfect as a starter for 8 people. Black Bomber Cheese Wax-covered(200g) A modern classic from The Snowdonia Cheese Company. Their flagship cheese marries a delicious rich flavour with a smooth creaminess, lasting long on the palate but remaining demandingly moreish! Handmade fruitcake (440g) Handmade in small batches this is a traditional fruitcake and one to savour. World famous fudge from The Toffee Shop (454g) This amazing fudge is quite simply the best you can find.